Teresa, an immigrant from Mexico has worked at a pork processing plant in Lincoln, Neb., since 2011. She didn’t want to use her last name because she feared that a family member, who still works at a plant, might get in trouble. Teresa worked on the line, or “the chain,” as workers call it. It is the heartbeat of any meat processing plant. It’s the mechanized driver of eviscerated hogs, cattle and chickens, hung up on hooks and quickly moving down a line at these massive meat factories. Workers disassemble the animals into the standard cuts for consumers — tenderloins and chicken tenders, beef chuck and pork chops. And some, like Teresa, stuff the meat into bags. This production feeds the average American, who eats about 200 pounds of meat a year. And the furious pace of the work causes a set of chronic physical ailments called musculoskeletal disorders, or MSDs, an array of injuries to workers’ muscles, tendons, ligaments and nerves, that cause sprains, strains, or inflammation. Teresa stuffed 7- to 10-pound hams in bags, at times up to 50 hams a minute. Starting with a wage of $11.50 an hour, she worked 12-hour shifts, sometimes seven days a week. She was awarded employee of the month four times. Then, she started experiencing problems in her right shoulder. After reporting the pain to her supervisors, they told her that if she was injured, she should go home. She says she went to the company doctor, who told her the shoulder problem was a bone spur. Finally, her shoulder got so bad, she was diagnosed with injuries from repetitive motions and had to have surgery. In 2015, federal regulators began requiring injuries to be reported within 24 hours. 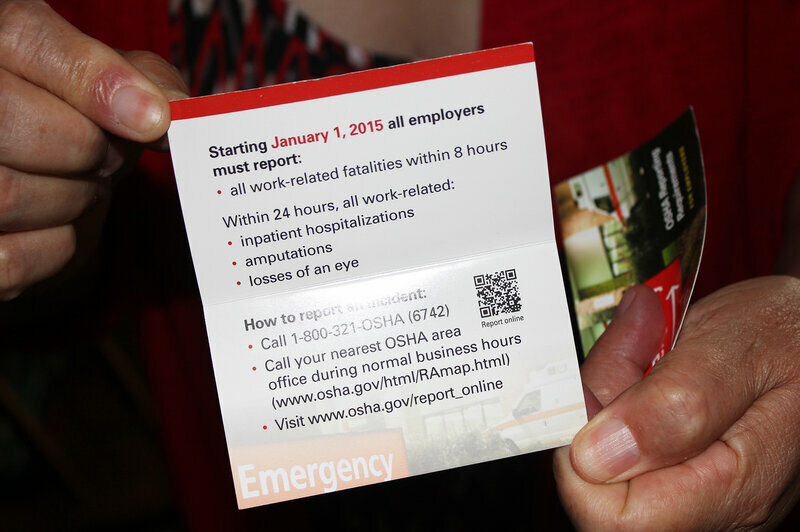 Nebraska Appleseed, a worker advocacy group, handed out these pamphlets to inform workers of the new rule. And yet, the government does not track MSDs diagnosed in slaughterhouse workers. “Part of the business model in this industry is to sacrifice worker safety on the altar of profits,” says Debbie Berkowitz, a former OSHA official and now a senior fellow at the National Employment Law Project. The North American Meat Institute (NAMI), an industry trade group, calls reports about fast line speeds and high rates of worker injuries a “myth.” The meat industry also often points to voluntary ergonomics standards they embraced dating back to 1990 as well as an increase in the prevalence of safety gear on the line. NAMI and meat companies cite a decline in worker injuries over the years. A recent government report also noted that trend, while criticizing the persistently high injury rates and poor reporting. Dan McCausland, NAMI director of worker safety and human resources, says there’s no cost savings for companies to run the chains fast because people will get hurt, thus cutting into company profits. But workers in meat processing plants tell a different story. They describe punishing rates of production, leaving them with a lifetime of pain and physical problems. Workers making on average $12.50 an hour, or about $26,000 a year, say they can get fired if their injuries prevent them from working harder; companies report constant employee turnover. Who’s in charge of line speeds? Many of the workers at beef, pork and poultry plants don’t speak English but they know that when the boss talks about OSHA, it means the government is coming around and the plant better be running right. Meatpacking workers who talked to Harvest Public Media said guards at the front gates of the plants signal when OSHA inspectors are coming in, the chain often slows down and more workers are added to the line. And yet, OSHA doesn’t oversee the pace of the production chain, a fact called a “regulatory perversion” by University of Iowa law professor Marc Linder in one of the first reports to call attention to line speeds and worker injuries in 1995. The agency is tasked with monitoring worker safety, but it continues to reject suggestions that it has any authority over production speeds. It denied a 2013 request by a dozen labor rights groups to set a lower line speed standard. In a written response to the labor groups, David Michaels, OSHA’s assistant secretary of labor, noted that MSDs can’t solely be attributed to line speeds. Ergonomic risk factors and the cold temperatures in plants must also be considered, Michaels wrote. The U.S. Department of Agriculture oversees the factory line in meat processing plants, but the agency concentrates solely on food safety, leaving workers worried about injuries caused by line speeds without a safety net. The government has argued that USDA regulations “act as a kind of de facto throttle on line speed that protects the workers,” says Ted Genoways, author of The Chain: Farm, Factory, and the Fate of Our Food, an investigative book about Midwestern meatpacking. “The USDA’s longtime argument is that they don’t monitor worker safety but that worker safety is assured by the inspection process, creating what they call a ‘friction point’ with the speed of the processing line,” Genoways says. Even that throttle is being removed, however, as the USDA champions a controversial program, already in place in many chicken plants, which reduces the number of government inspectors and hands over many food safety duties to the companies. The USDA has recommended developing similar programs in pork factories. Teresa had surgery, but it didn’t help. So she complained to her superiors. She kept working. Pregnant with her second child, she says she wasn’t even allowed bathroom breaks. Finally, after five years, Teresa felt she had had enough and quit her job, asking for a payout for her injuries. She was told that workers’ compensation insurance doesn’t pay for pain, but was awarded $1,700 for her time away from work. Now 31, Teresa can work only part-time. Her shoulder continues to bother her. She’s often at home with her three children, a 7-year-old boy, a 3-year-old daughter and a 9-month old boy. She tells her friends who still work at the plant to get out. How much is an arm worth? Complicating any chance at recourse for workers with MSDs is the ambiguous nature of injuries, both medically and legally. Many workers are told to go back to work and are barred from reporting injuries, as managers want to keep OSHA injury reports low, according to a recent Government Accountability Office. Injured workers say they stayed on the line because of a lack of sick leave or for fear of losing their jobs. The claims are hard to prove, he says, because a worker must apply a checklist of risk factors. How many repetitive motions are required on the job? Does the worker hold his extremities at an awkward posture? Is there a vibratory mechanism attached to the job? “It’s a Byzantine checklist,” Morrell says. Experts have to be hired, which is expensive, he says. Calculations for claims are complicated and involve a worker’s age, body part and pay rates. And these calculations vary between states because of workers’ compensation laws. “At some point for serious injuries there’s an acknowledgement: We’re never going to get these things back to the way they were before,” Morrell says. Gabriel, a Mexican immigrant living in Nebraska, works at a pork slaughterhouse. He didn’t want to name the company he works for or use his last name for fear of retaliation towards family members who still work there. He has had friends and family member who have also been fired, mostly for being injured, he says. In a time when concern for animal welfare has changed the way companies do business — making sure eggs are produced cage-free, that chickens roam free-range, that pregnant hogs are not confined in small gestation crates — there is still little outcry about conditions for workers who produce our meat. Last year, Oxfam America released a report about the “grim” conditions workers face at poultry plants. In “Lives on the line: the human cost of cheap chicken,” the anti-poverty group placed the responsibility for changing the industry on consumers.